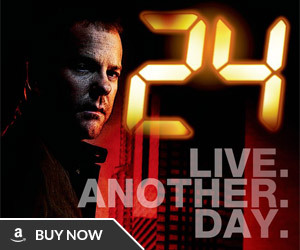 Update 4/1: As expected, ’24’ has been removed from Netflix and unfortunately it’s not coming back anytime soon – Amazon has purchased exclusive streaming rights to the series. 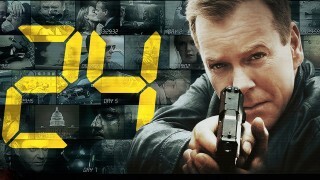 Many concerned “24” fans have emailed us that the series is expiring on Netflix streaming April 1, 2014. 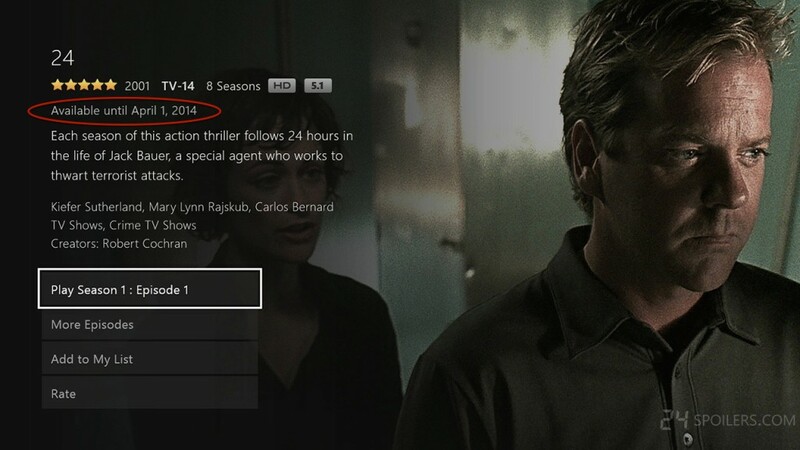 We’ve confirmed this is true in the United States – below is a screenshot from Netflix US with the expiration date circled in red (click for full size). 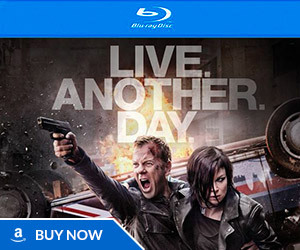 Netflix has been the best way to watch 24 – aside from the convenience of not having to switch discs, it’s also the only service that has the earlier seasons available in high definition. 24 was first added to Netflix on April 1st, 2010. The following year Twentieth Century Fox signed a new multi-year contract with Netflix. No other FOX television series have an expiration date listed – this is an issue specific to 24. Hopefully FOX and Netflix work out a new deal, but you might want to prepare for the worst case scenario and accelerate your 24 re-watch just in case it gets pulled from the service. There might be only ten days left to catch up via Netflix. Por favor NO!!!! Tendré que dar de baja netflix! They worked out a new deal last time this happened. Let’s hope they can do it again. Maybe this is being done because of the release of a new 24 box set with is rumored to be a blu-ray re-release, maybe they want you to pay up to catch up on the show. Probably too much to hope for it just being an April fools joke. Hey everyone, there’s this thing called Amazon Prime. And until some date in April, it’s cheaper per year than Netflix. It’s $79/year, until late Apr. when it becoms $99/year. Get it now!!! Amazon Prime’s price was raised to $99 just two days ago so it’s no longer cheaper than Netflix. There is a 30 day trial though for new users though I believe. Not everyone can afford to pay 79$ in one lump sum for a streaming service. For someone like me who has directv Netflix is a nice commodity at 7.99 a month. 79 and soon 99$ on top of all other monthly bills for a second source viewing just isn’t worth it to me. As someone who has the DVD set and doesn’t see the switching of discs as a big deal after every 4 episodes, I’m not quite sure why this news is a big deal – and the HD aspect seems destined to be solved via a Blu-Ray release. That’s why I have the whole 8 season collection. My suggestion: Buy each season through either Ebay or Amazon for low prices. I’m very glad then that I have the whole series on DVD. Phew!!!!!! Here are two other places to check to fill out your collection. Target from time to time has had 24 DVDs for sale. I recently bought 24 S1 there for $16.99. Also, I live near a used book chain store called Half Priced Books. They sell used DVDs as well as books. I found almost every season of 24 there for $9.99 to $14.99. The DVDs were is great shape for being used. A lot of times Netflix puts the expiration date on there and does a lot of last minute renewals. That’s why they disabled third party expiration notices for sites like instantwatcher.com because they proved to be so unreliable. I really wouldn’t worry. I think if it were expiring from Netflix, it would expire from Amazon too. Good point, let’s hope this is another one of those last minute renewals. As for Amazon Prime, their contract with FOX was signed six months after this Netflix deal (September 26, 2011) so the expiration dates on the two services wouldn’t necessarily line up together. Why are they Pulling it? It’s times like these that make me glad that I have the whole series on DVD. I hope everyone finds a way to finish their marathon in time! I bought S1-6 just before the premiere of S7 on FOX and they were discounted to $19.99 each for a limited time. I would bet money that retailers will do a similar promotion in May, just around the time of 24:LAD premieres, to capitalize on the marketing hype and pull more viewers in that get hooked on the new season but may not have followed the series regularly in its first run. NOOOOO!!!! Please don’t take this off! I have to get caught up for the 9th season!!! Why would they. Take away those other Netflix Movies and Shows but why 24. If enough people get upset they will probably re sign with netflix. Everyone that loves this show must voice their opinion. I believing that some how some way that Netflix will continue to provide viewing of the series 24. There just isn’t another show that is as good as this one. I would be so unfair to the many viewers of the show to discontinue it at this point. Please give us more time to complete our viewing of the seasons one to seven. And also many of us look forward to watching the new shows in may which means high ratings. Very smart. They’ll do this cause anybody who will watch in May that hasn’t watched the show before will have to buy the series on DVD or blu ray making Fox more money. Well unless you download or stream somewhere else but some people won’t be able to do that. 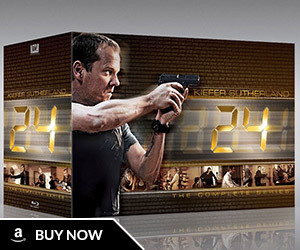 I’m a huge fan of 24 and bought all the box sets on release. I was in the middle of Season 6. No more Netflix for me! I just canceled after having it for 5 years. This was stupid. They knew with the new season starting people would be watching the past seasons, they should have made a deal. I can’t afford to pay to watch this on Amazon or I tunes. Amazon is so money hungry they have went up on everything. Nope I’ll just try to stream it somewhere for free. Thanks Fox and Netflix!!! Furious!!!! Nothing to watch now on Netflix until Orange is the New Black returns. Totally ridiculous to pull past episodes, we are so upset with Netflix! Movie selections are not great, looking for other options! really!!! Everything else on netflix is complete crap. GET RID OF ALL THOSE THIRD PARTY MOVIES NO ONE WATCHES!!!!! People dont worry, 24 is still avaiable on a lot of netlfixes outside of america, just download this add on from google chrome called ”hola” and change the region to uk or another region that still has 24 and it would work just like before, awesome.